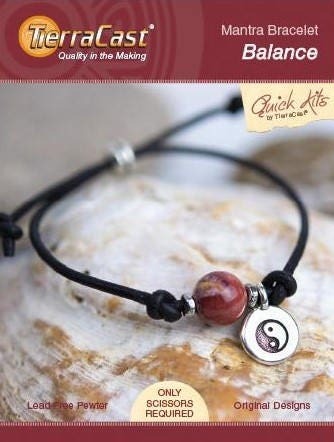 TierraCast Quick Kits: Mantra Bracelet. Balance. Additional Information: This kit includes 1 Jasper Gemstone Bead. 1 Grooved Bead. 1 Yin Yang Charm. 2 Nugget Spacers. 20" Leather Cord, Black. Instruction Booklet. NOT INCLUDED: Required Tools: Scissors. Optional Tools: Awl or Sharp Nose Tweezers and Jewelry Adhesive.